Social media usage is ubiquitous, and has a higher prevalence of usage in younger age groups. When the paper I am reviewing was written, 71% of adults with internet access reported using Facebook, and two thirds checked it daily. And now, three years later, I’m sure it’s used even more. Unfortunately, many people don’t have a good sense of what is appropriate or not. 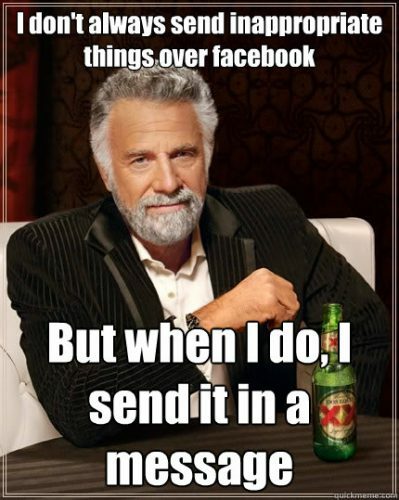 And coupled with confusion about privacy settings, some post things that they probably shouldn’t. And unfortunately, everyone else on the internet can view them. As a resident, it is more common to be “fired” from residency for unprofessional conduct, not cognitive failure or malpractice. When one is under investigation, the professional organization conducting it may look at prior behavior. And these days, that behavior may be years old and posted for all to see. Is this a problem? Surgeons at the University of Nebraska were interested in how Facebook was used by surgical residents. They identified surgical residencies at 12 states in the Midwest region. They found all surgical residencies within the region and searched their program websites for the names of active residents. Facebook accounts were then created by the authors and were used to determine which of these residents had their own accounts. The researchers then viewed those pages and classified the content into three categories: professional, potentially unprofessional, and clearly unprofessional. Definitions were based on criteria from the ACGME and the AMA. Accounts that were not accessible to the public were judged professional. A total of 57 surgical residencies were identified, and 40 provided an institutional website with a current roster of their residents. Of 996 surgical residents, the accounts of 319 residents could be evaluated. Bottom line: Be careful! The use of social media is pervasive. Inappropriate or unprofessional can end a career, or can come back to haunt you years later. And this phenomenon is not limited to surgical residents. All professionals, even attending physicians, may succumb to its charms. Know the social media policy for your hospital or residency program. Be very careful, and think very carefully about everything you post. Take advantage of built-in privacy settings for the platform you are using. But don’t assume that using them will keep inappropriate material from getting out. If in doubt, show your potential post to a trusted and reliable friend for a “second opinion.” Otherwise you may find your (not so) friendly “compliance police” knocking on your door. And possibly ending your career. Reference: An assessment of unprofessional behavior among surgical residents on Facebook: a warning of the dangers of social media. J Surg Educ 71(6):e28-e32, 2014.